Oct 25 Holiday Gifting with L'Occitane. Hey everyone, welcome back! Today's post is sponsored by L'Occitane and it's all about their Signature Advent Calendar. With the holidays right around the corner, what better gift to give than 24 mini surprises all in one. From Lotions to shampoos, this Advent Calendar is perfect for the bath and body product lovers in your life or for the ones who need a little extra TLC in that department. It's also the best way to try out multiple products and you get to see which ones work best for you. The Signature Advent Calendar retails for $69.00 (USD) and is a $104 value. It includes 24 mini products which in my opinion is the best way to sample a variety without paying the price. It also allows you to find out what works best for you and when you find the products you love, you can upgrade and purchase the full size. Give the gift of radiant soft skin, moisturized lips, and a luxurious eau de toilette all in one great gift. If you want to learn more about the products inside and some of my favorites, read below! I've recently gotten into shower oils and as one of their top selling products, I knew that the Almond Shower Oil would be an instant favorite. It's a gently hydrating cleansing oil that emulsifies enough to make you feel clean and hydrated at the same time. It also smells AMAZING and leaves a soft lingering scent throughout the day. 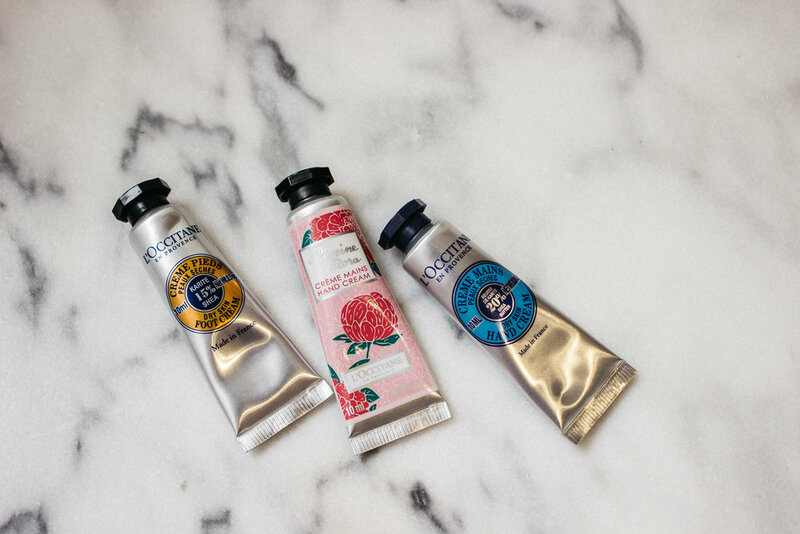 The Peony Flora Hand Cream is my favorite hand cream out of the bunch. I love anything floral so this baby has been in my purse and is getting lots of love! I love their hand creams because they are a perfect consistency, not too thick and not too runny. They also don't make your hands feel greasy after application which is a plus! Whether you're treating yourself (which is very important and well deserved) or buying it for a friend/loved one, the L'Occitane Signature Calendar is the perfect gift. You'll definitely impress your boss, mother-in-law or friend with this generous present. Or even if you're someone like me who enjoys hand creams, body washes and anything and everything in mini form - this is the perfect "treat-yo-self" kind of purchase. One of my favorite things about L'Occitane products is that the scents/fragrances are subtle and are not overwhelming. I feel like I can enjoy all of the products without a headache since they have a lighter aroma. Disclaimer: AD| This post is sponsored by L'Occitane, but as always all opinions are my own and honest. Products that are PR samples will have a "*" otherwise products are purchased on my own. Products may contain affiliate links. No copyright uses are intended. Oct 1 September Skincare Edit.